NEW ORLEANS – Khia Kurtenbach of U. of Chicago and Darin Lau of UW-Eau Claire proved themselves to be champions on and off the cross country course. That’s why Kurtenbach and Lau were named the NCAA Division III Scholar Athletes of the Year for the 2017 cross country season by the U.S. Track & Field and Cross Country Coaches Association (USTFCCCA) on Thursday. There were 668 student-athletes named USTFCCCA All-Academic with women accounting for 55 percent of that total number (368). In order to qualify for this honor, student-athletes must have a cumulative GPA of 3.30 and finish in the top 25 percent of their respective regional championship meet. Kurtenbach, who owns a 3.85 GPA in Molecular Engineering, dazzled during her senior season on the cross country circuit. The Wisconsin native started the postseason with a 10-second victory at the UAA Championships, then followed it up with a five-second win at the Midwest Region Championships. Kurtenbach then turned her attention to NCAAs, where she outpaced Claremont-Mudd-Scripps’ Bryn McKillop by six seconds for the individual title. 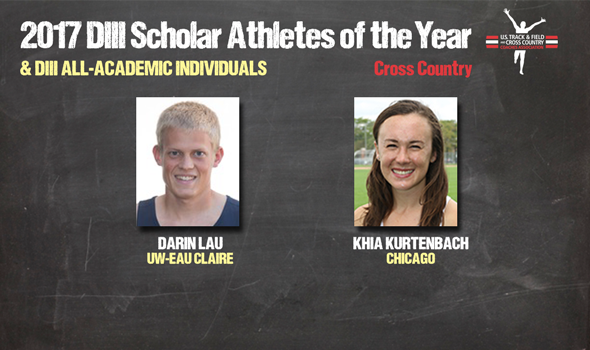 Kurtenbach is the first U. of Chicago athlete bestowed with this honor. Lau, who owns a 3.81 GPA in Math Education, left little doubt that he was the man to beat during the 2017 season. The senior from Eau Claire, Wisconsin won six of the seven meets in which he competed. His only loss came at the Principia College Cowbell Invitational, where he finished third. During the postseason, Lau hit another gear. Lau won each of those three races by an average of 17 seconds, including a nine-second victory at NCAAs. He is the second UW-Eau Claire male athlete to win this award in the past three years. Lau joins former Blugold standout Josh Thorson (2015) in this regard. See below for a full list of athletes honored by the USTFCCCA.